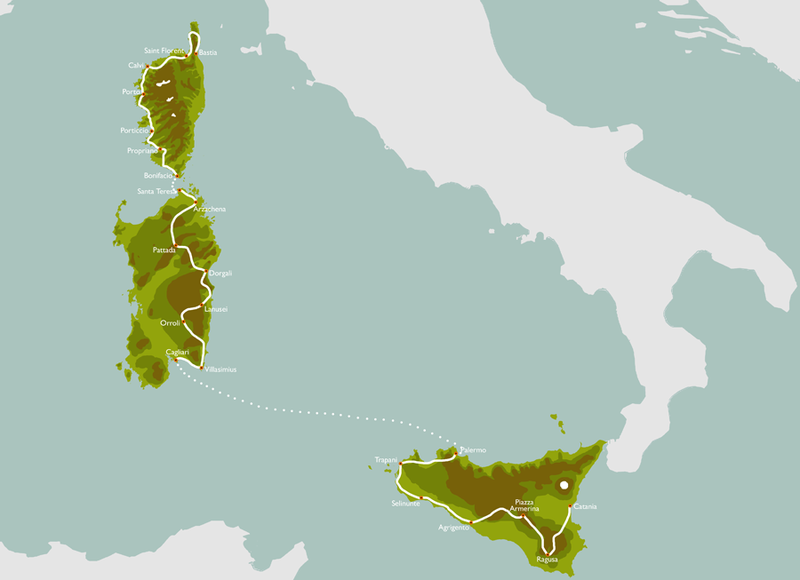 Epic bike journey across 3 beautiful yet so diverse islands, Corsica, Sardinia and Sicily. What makes them unique? Ok, there is no question that we are talking about 3 cycling paradises, and certainly you fall madly in love with each one of them. But what really makes them different? The sun, the beauty and quality of life would seem to be the only features shared by these three islands. In fact, despite their proximity, this three jewels of the Mediterranean have a very different history, landscape, gastronomy and national character, sometimes wildly different! I mean, if you are in Corsica with a smile on your face they may ask themselves: “Is he okay??”. If you are in Sicily without a smile on your face they may ask directly to you “Are you okay??”. Those differences make the wealth of the Mediterranean. As we’ll cross the islands by bike, sometimes they’ll look so similar, then suddenly we’ll discover something unique, making them looking like worlds apart. Sicily – Arancini, Caponata, Cannoli.